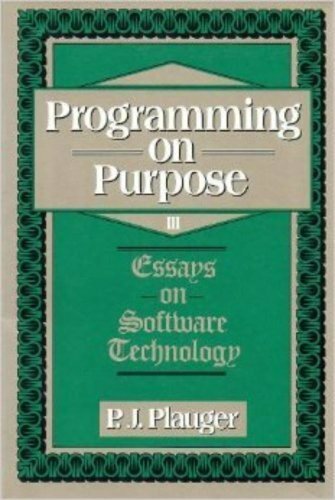 Amazon.com description: Product Description: P. J. Plauger's monthly column "Programming on Purpose" has been entertaining readers of Computer Language magazine for years. He writes as readily on how to be a software entrepreneur as he does on the innards of floating-point arithmetic or the turbulent world of software design methodologies. By popular demand, he has gathered six and a half years' output into several collections, each with a common theme. Essays on Software Technology covers a number of important technical themes. Here you will find essays on such basic topics as practical computer arithmetic and computer outputs that match the human senses. You will find discussions of cutting-edge issues such as public-key cryptography and cross-cultural coding styles. And you will find a complete set of his incisive April Fool's columns. Plauger's style is clear without being simplistic, reducing complex themes to bite-size chunks.